Ashbourne 2001, the maiden vintage, was rated 92/100 by Steve Tanzer in his influential US publication - the International Wine Cellar. He described the wine as follows: "Good full ruby red, high-toned aromas of spicy red berries, dried flowers, mint, marzipan and smoky, nutty, slightly resiny oak. Then impressively deep in the mouth, with flavours of black raspberry, iron, leather, smoke and earth, perked up by a note of tart cranberry. This boasts terrific freshness and sappy depth of flavor. Finishes firmly tannic and impressively long. An unapologetically French-style pinotage, if that's possible for a South African variety." Ashbourne is the first bottled result of Anthony Hamilton Russell's ten year quest to produce a distinctly classically styled Pinotage based wine, that belongs in the company of the world's great benchmark reds, without in any way replicating them or seeking to taste like them. Karikari Estate Pinotage 04 won Gold and ‘Best in its Class’ at the recent Bragato Wine Awards held in Gisborne. Karikari Estate also won Gold for their Merlot Malbec Cabernet Sauvignon 04. The Bragato Wine Awards recognise the grape grower, the vineyard and excellence in viticultural practice. They are the only New Zealand awards which recognise the vital input growers contribute. General Manager Mark Rose says "This is Karikari Estates second vintage and it’s an endorsement of the efforts of our viticulture and winemaking team’s attention to detail that we have been able to produce two gold medal winning wines. Our aim at Karikari Estate is to craft wines of the highest quality that accurately reflect the environment in which they are grown. The challenge is to cultivate classic varietals in an uncharted meso-climate using traditional methods"
Beaumont dedicated their 2005 vintage to Hope Marguerite Beaumont "who has been an inspirational figure for us all and is the namesake of the Single Vineyard Chenin Blanc that we harvested on her 90th birthday this year." Winemaker Sebastian Beaumont reports that the "2005 harvest has been a combination of good luck and hard work. A dry winter, no snow, then rain and lightning to spark the vines to life in spring had us guessing as to what this vintage was going to deliver. "High nitrogen levels due to the lightning gave lots of healthy strong growth that we kept in check with good canopy management and early exposure of the bunches to the sun. This was followed by a dry summer, with rain only in February, resulting in small berries and a lighter crop especially on the Pinotage and Tinta Barocca. "We had to be patient with the reds leaving them to reach full tannin ripeness until the sugars were nicely balanced with the acid levels. Great analysis, and even better flavours and structures show wines with good ageing potential. The Pinotage is very similar to ’04 with lovely cherry and strawberry fruit backed by good structure and fine tannins." Beaumont also use Pinotage in their port. Sebastian says "A few pairs of size 13 feet helped the smaller feet successfully stomp the Pinotage and Tinta Barocca grapes at our annual port stomp this year. The resulting port is rich with Christmas pudding and stewed fruit aromas and is slowly marrying with the wood matured grape spirits that were used for fortification." Beyers Truter, chairman of the Pinotage Association, says "2005 is one of the best vintages ever for Pinotage wines due to the difficult weather conditions during the ripening and harvesting season which created small grapes with intensive colour and flavour"
Abé Beukes, winemaker at Darling Cellars: “Once again this is a vintage characterised by variation. It is a soft, drinkable vintage, but don’t try to keep the wines five or ten years in the bottle. I am very satisfied with the Sauvignon blanc and the Pinotage, because they were picked relatively early, before the heat wave and the rain." How do you say Pinotage? A survey of more than 500 customers of the UK pub restaurant chain Chef & Brewer showed that over half ask for Chardonnay or a house wine to avoid embarrassment by mispronouncing wine names. The ten most difficult names included Chenin Blanc and Pinotage. 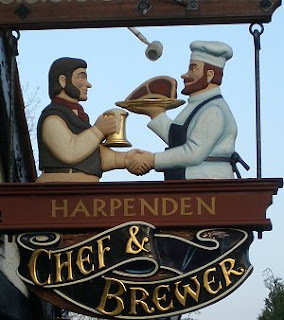 To find out how to pronounce Pinotage I travelled to my nearest Chef & Brewer pub, ‘The Old Bell’, in the country town of Harpenden. “I’d like a glass of wine”, I said to the young barman. He showed me a wine list which included two South African wines, Impala Chenin Blanc and Impala Pinotage. I pointed to the second and asked what it was like. “The Pinotage?” he replied, correctly pronouncing it ‘pinno-tahj’, and maybe puzzled by my inability to notice its brief description printed on the list (‘modern style, bursting with flavours of damson and spice’). “I haven’t tried it myself,” he said, “but let me give you a taste so you can see if you like it”, and he reached for a glass and poured a small measure. Having tested and given Chef & Brewer’s Old Bell full marks for pronunciation and customer service, I relaxed by the fireplace with a full glass of ‘modern style’ Pinotage, shipped in bulk and bottled by Waverley Wines & Spirits in Scotland. South African wineries are familiar with the British reluctance to grapple with words from other languages, causing some to change names to suit the UK market. But this survey shows that what is in the bottle could be as big a problem. Graham Beck may have the right idea in calling their entry level Pinotage ‘Pinno’. The top rating British TV series ‘Footballers Wives’ featured a glamorous model named Chardonnay, which helped in making the word familiar to viewers; perhaps WoSA could consider sponsoring some new characters including centre-forward Pieter Pinotage and his beautiful actress girlfriend Chenin. The fruit for California's Domaine St Gregory from Perry Lloyd's vineyard. I asked Perry how he came to plant Pinotage. "When I bought my vineyard," says Perry, "it was almost entirely planted in Chardonnay and Pinot Noir, and while they are both wonderful varietals, and do very well in our terroir, wine-growing is so prone to fluctuations and happenstance that I thought it wise to branch out, so to speak. So, when I had to do some replanting (due to Phylloxera in some own-rooted Pinot Noir vines), I put in a row each of four varietals that had not been tried before in my particular neighborhood - two relatively conservative: Syrah and Viognier; and two more experimental: Arneis and Pinotage, and so far at least, I am quite glad I did. "I got my plants from the Duarte nursery, here in California, and I don't know where they got their budwood, though I suspect it might have been Steltzner vineyards, since they seem to propagate the most around here. All four varietals seem quite happy and have produced some very nice fruit, but the biggest hit (and, frankly, surprise) has been the Pinotage. Everybody who has tasted it has been very impressed, and Domaine St. Gregory liked the current production enough to ask me to bud an acre of my replant over to Pinotage, for their use. That worked out perfectly, since pruning the current row provided just enough budwood to bud over one acre of my Pinot which should produce nicely next year. "Pinotage production does seem to be taking off lately in this region, with several enthusiastic proponents, including McNab Ridge, Domaine St. Gregory and Steltzner." Jacobsdal Estate 2001 - Other wineries have been redesigning their labels, getting new names and changing winemakers, but at Jacobsdal father and son Cornelis and Hannas Dumas keep a steady hand on the tiller. They continue to make Pinotage they way they always have, and showing Distell's keen consultants the door. And why not, when they make such enjoyable dinner wines as the 2001? Beautiful dark red colour, good well rounded body with meaty fruit flavours, and a long smooth finish. This wine slips down a treat with dinner and leaves one surprised the bottle empties so quickly. L'Avenir Estate 2003 - Lusciously drinkable wine, sweet plummy fruits are underscored by soft tannins and uplifted by spicy mulberry tones. I just love this wine. Sentinal 2003 - Deep purple red colour, smoky nose, mouthfillingly fruity, plums, smoke and spices, tobacco leaves on finish. Its so very drinkable its a real surprise to see its 15% abv. Diemersfontein's Carpe Diem 2003 Pinotage won the 2005 International Wine Challange Trophy for South Africa's Best Red Wine. At the evening ceremony at London's Grosvenor House, on Wednesday 7 September, Diemersfontein's Carpe Diem Pinotage 2003 was awarded South Africa's Red Wine Trophy for 2005. David Sonnenberg, Diemersfontein's owner, who received the award on behalf of the estate, commented: "This is a thrilling award and it has been a great year for Diemersfontein. We know competitions are not everything, but it's good to be receiving recognition across the whole range of (winemaker) Bertus Fourie's wines. The fact that the award is for Pinotage is especially pleasing." "South Africa's Pinotage has had a great showing at the IWC with our trophy, Rijk's gold, Swartland's silver and 17 bronzes", states Sonnenberg. It is understand that many visitors to the show this year were complimentary about Pinotage. Could it be too much to expect that South Africa's Pinotage sceptics show a touch of humility (just sometimes) and listen to the way our wine is appreciated outside our country?" concludes Sonnenberg. South Africa gained six Gold medals at the show. Of those six, two of were for varietal Pinotage, Diemersfontein's Carpe Diem Pinotage 2003 and Rijk's Private Cellar Pinotage 2002. Tamara Lover at www.gothamist.com asks "How could you ever improve on Pinot?" and acknowledges that maybe you can't but that "South Africa has found a way to kick it up a notch." Tamara says Pinotage makes a wine "that is unique, seductive and vibrant. Pinotage is a little more forceful than Pinot Noir with a bolder aroma that is a combination of raspberry, banana and meaty, spicy notes. The first sip is alluring and unexpected – not as aggressive as you would expect from the scent. The texture is soft and smooth and unfolds to reveal tart raspberry and black cherry notes with a spicy finish." Tamara recommends 2004 Graham Beck Pinno: "At just $8.99 a bottle it’s approachable, distinctive with a little bite – we like to think of it as Pinot Noir with a Brooklyn edge."